This will make it much easier for people inputing info into the molecules blog. There are still problems with generating SMILES automatically. David Bradley just published 2 articles that are of interest to the UsefulChem project. 1) An interview with Peter Murray-Rust highlighting various efforts towards open source chemistry. He mentions the use of CML (Chemical Markup Language). As I indicated previously, we need to add this to our molecule blog so that it can be read machines more easily. ChemSketch can export molecules in CML format but I have not found a reader that works properly to read that output. If anyone finds this that would be very useful. 2) A review of Chmoogle. I think we have made some good progress in moving towards automation today, thanks to people like Ruslan who figured out how to use ChemBasic to spit out molecule names form the list of anitmalarials posted in this blog previously. Ruslan will now try to provide SMILES codes and perhaps pictures of the molecules as gif for the 220 anti-malarial list. If this seems confusing to people who just fall onto this post, keep in mind that our objective is to synthesize the most promising anti-malarial candidates and have them tested ASAP for in vitro on red blood cell infection assay. So once again, if any aspect of this project is interesting and compelling to you - contact me. Researchers at Queen’s University Belfast hope to revolutionise the world of chemistry by developing a culture of adventure. The team, including Dr Joe Vyle and Dr Stuart James, received a grant from the UK's Engineering and Physical Sciences Research Council (EPSRC) to develop this "culture of adventure" at QUB by exploring new ways of thinking and challenging the norm. porous liquid, on the other hand, would flow because the holes would be continually moving around allowing it to mop up or release other substances incredibly quickly. "This has the potential to change the way that chemical plants operate or even improve dialysis treatments in hospitals," James says. 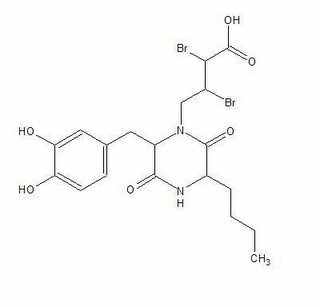 The aim of this blog is to keep track of information on the compounds we wish to synthesize and the reagents necessary to do so. For example the target compound in the previous synthesis is listed as UC0001 in usefulchem-molecules. Everything is cross-linked between the blogs so it should be easy to follow. The key to tracking molecules is the SMILES code. You can get that from ChemSketch under tools->generate SMILES code for any highlighted molecule. The name can be generated in a similar way from ChemSketch. The SMILES code is the most versatile way of inputing a structure into a database, like Chmoogle. Unfortunately, Chmoogle's database is not as extensive as I had hoped. But you can input the SMILES code into company catalogues, like Sigma-Aldrich to find reagents. Doing this I found the Aldrich number for Reagent A and a price of about $25/5 grams. For Reagent B, I just put the jpeg, the SMILES code and links to the relevant post in UsefulChem. I want to see if others can understand what I am saying and add the rest of the info. The most useful info is of course the commercial availability and the cost. Ask me to add you as member to this blog if you wish to contribute. Yes, we are using a blog as a database. That is certainly not the most efficient way to store and retrieve information but with relatively few compounds I think the advantages are significant. The blog is accessible by anyone and is archived quickly by search engines, especially Blogsearch. This is a free and hosted solution so anyone can replicate this model immediately in other fields. The blog provides an intuitive environment for both humans and autonomous agents. Since Word now has a plug-in to update Blogger, we might consider VBA as a quick hack to carry out some of the automation. And perhaps most importantly, a blog represents an easy to way to create an RSS-CML (Chemical Markup Language) feed so autonomous agents can read the feed as chemical information. See Rzepa and Murray-Rust references here for more info on CML. ChemSketch can export CML but I have been able to have that output interpreted correctly by the RSS-CML reader mentioned in those references. This would be a useful thing for the programmers to figure out. Here is an example of a synthesis using the solid-support strategy described previously using standard Merrifield polypeptide synthesis conditions. 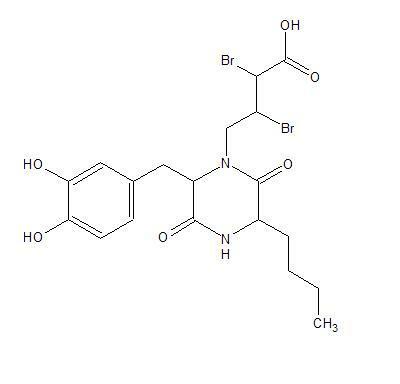 All compounds are commercially available from Sigma-Aldrich but the tBOC amino acid derivatives were not in Chmoogle. Also the only listed source of the commonly available bromoacetone was a private collection. So it seems Chmoogle should be used cautiously to determine commercial availability. Steps A and B should proceed without difficulty. Step C is more problematic. Polyalkylation of the primary amine or alkylation of the phenols may occur also. 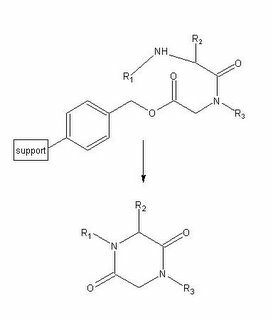 An alternative to step C might be reductive amination with pyruvaldehyde. I think the aldehyde end will preferentially form the imine over the ketone. 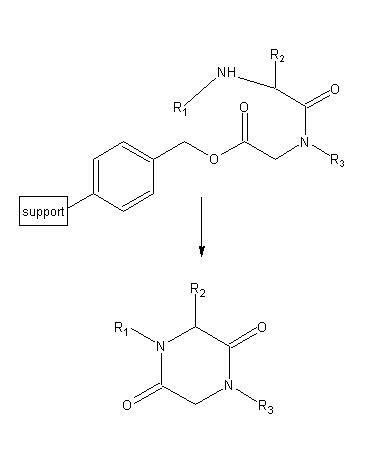 I am also concerned with the cyclization to the diketopiperazine - will that be problematic for a secondary amine? The reaction conditions for cyclization are given previously. If anyone has a suggestion or comment about my proposed synthesis please contribute. 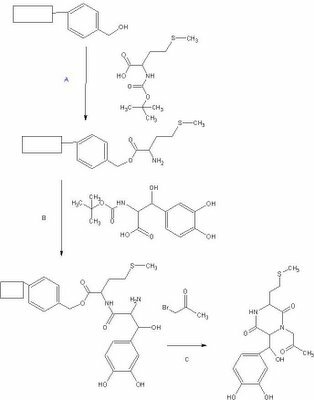 It looks like the compounds in this lot of potential anti-malarials are part of a library of 2,5-diketopiperazines. A search on Google Scholar suggests a solid-phase synthesis from dipeptides might be a good strategy. They use a standard Merrifield polystyrene resin as solid support. I suspect most of the amino acid derivatives will be commercially available. Next steps: identify cost and source of reagents needed to make the first few compounds. Jay Bhatt just told me about Chmoogle, the new eMolecules search engine for chemicals. 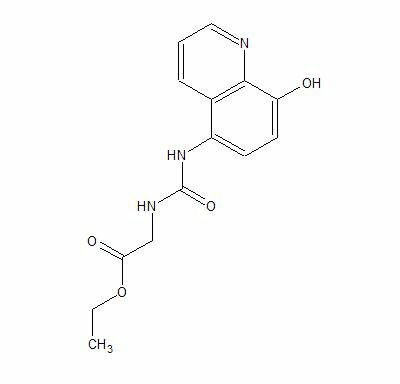 Doing a quick search, I was able to find many commercial sources for fragments the potential HIV protease inhibitors on the watch list at UsefulChem. I'll post technical details in this blog shortly. 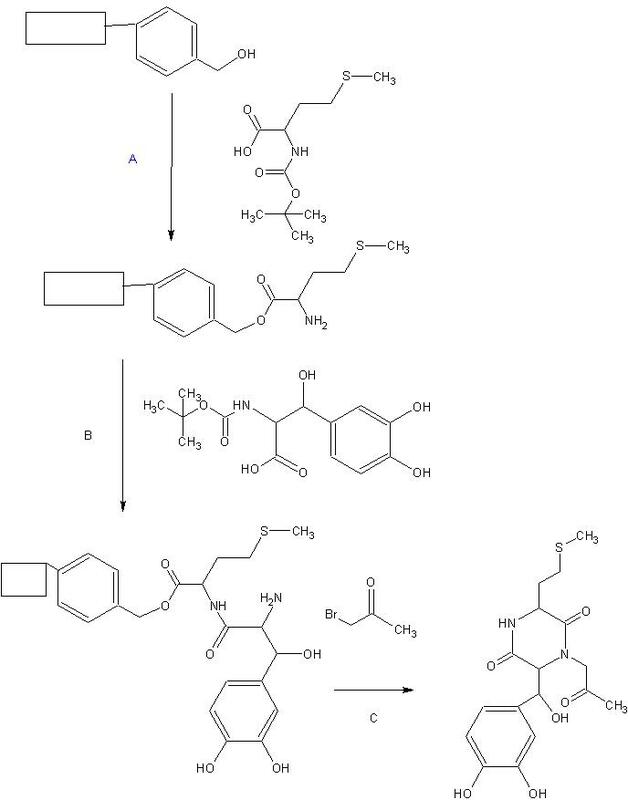 Here are the hits for potential enoyl reductase inhibitors for malaria. The first 100 are in pdf format. The whole group of 220 is in the Chemsketch and SDF files. We do have a collaborator (Bill Bergman) from the Drexel Queen Lane campus who is willing to do some in vitro testing. Pick a compound and suggest a synthesis. Thanks to Find-a-Drug for the list! Update: Chemists Without Borders have started a similar discussion. When the first tube-wells were sunk in villages on the Indian sub-continent during the 1960s, purportedly to offer the first reliable, year-round water supply there, the people were incredibly wary, describing the water as the "Water from Hell". In subsequent years, it has emerged that there was indeed some foundation to their suspicions as the insidious effects of arsenic poisoning have taken hold of hundreds of thousands in this area of the world as once insoluble arsenic salts in the bedrock have oxidised to soluble forms that then enter the water supply. You can read more about the arsenic problem on my personal site. There are numerous problems associated with the arsenic problem many of which have a chemical solution. First, is providing villages with a safe and easy way to test their water supply. At the moment, many tubewells are mislabelled as uncontaminated when they're not, and many have been given the green flag even though they contain solubilised arsenic. Secondly, a simple way to extract the arsenic from contaminated water is needed. Researchers such as Dipankar Chakraborti of Jadavpur University and his colleagues have been fighting for recognition of this insidious environmental problem that has already affected hundreds of thousands of people. They are working on assays and clean-up, but there is still a need for novel thinking to tackle the hellish water. 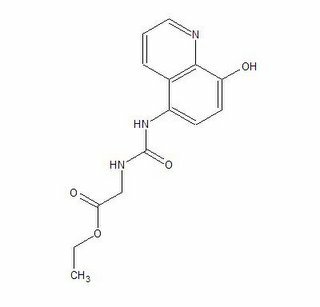 Following up on my last post about Find-A-Drug, Keith Davies has kindly sent me a library of 90 compounds that scored as hits for possible HIV protease inhibition. Here is a pdf version just to look at. Here is the library in SDF and ChemSketch version if you want to pluck out one of the molecules to manipulate. A free version of ChemSketch is available here. We are looking for efficient syntheses of these molecules from commercially available materials. First check that it has not already been done. We are also looking for someone to do assays. Ferrates (iron(VI) and iron(V)): environmentally friendly oxidants and disinfectants. In many parts of the world there are people living without basic human necessities such as clean water. Safely and cheaply decontaminating drinking water is a pressing need in those countries and this paper explores one possible solution for disinfecting water using iron. Iron in the form of Fe(VI) and Fe(V) are powerful oxidants that can potentially disinfect and decontaminate wastewaters without producing harmful by-products. Searched Google Scholar: "environmentally friendly chemistry"
"The ‘revolutionary’ potency and selectivity of siRNA inhibitors of gene expression promises to enable improved targeted cancer therapeutics, but the means for systemic administration and targeted distribution to disseminated metastatic lesions are needed. " RNA interference is a recently discovered biological process with the potential to revolutionize medicine. However, effectively delivering RNAi to target cells and subsequently turning off the target gene presents a huge hurdle. This paper outlines one potential delivery system dubbed “nanoplexes”. These nanoplexes consistes of a polyethylenimine (PEI)-polyethylene glycol (PEG), siRNA inhibiting vascular endothelial growth factor receptor-2, and a peptide ligand. The nanoplexes were intravenously administered to tumor mice and showed a significant inhibition of tumor growth. However, PEI tends to be toxic at high levels so a more effective delivery complex needs to be synthesized to be used in humans. Used Google Scholar: "siRNA therapy"
Find-A-Drug is a project leveraging the vast computational power of the idle time on the computers of volunteers. They have about 250 target proteins listed for major diseases. Although the inhibitor hits are not made public, the site does a good job of summarizing relevance of each protein in the disease process. "The metallacarboranes appeared to occupy the portion of the protease used to hold key proteins in place as part of the infective cycle of HIV, preventing the proteases from working." They used X-Ray Crystallography to show the binding site. "The viable storage of gases for use in fuel-cells, especially for mobile applications, has been identified as a particularly pressing problem to be solved"
In this paper methane is complexed within a solid calixarene crystal. Pressure measurement is used to quantify. "to find new candidates of an anti-HIV agent"
In this paper, infection of MT-4 cells with HIV-1 was monitored by cell viability quantified with 3-(4,5-dimethylthiazol-2-yl)-3,5-diphenylformazan assay. The absorbances were read at two wavelengths (540 and 690 nm). "For over a decade, attempts to find new efficient inhibitors have attracted and absorbed the curiosity, talents, and energy of many scientists"
New inhibitors of HIV protease are needed to find new AIDS treatments. In this article the crystal structures of protease - ligand complexes are used to show the binding site.